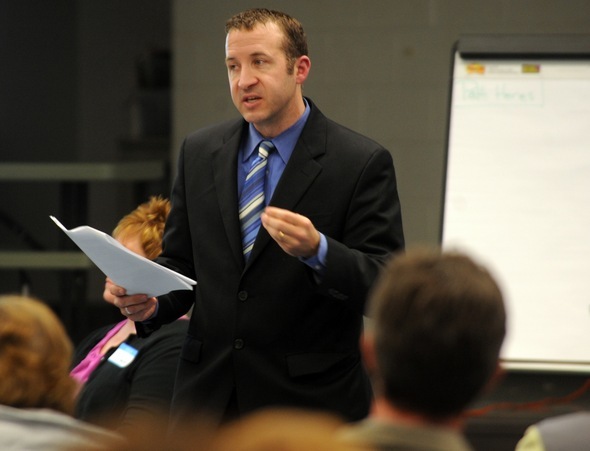 Posted on Wed, Jan 11, 2012 : 5:58 a.m.
Assistant Superintendent of Instructional Services Steve Laatsch gives a presentation during a past Saline Board of Education meeting. On Tuesday, he proposed a possible future radio commercial campaign for the district. This story has been updated to include Saline's head count numbers to show loss of enrollment. Saline Area Schools’ Board of Education will consider spending general fund dollars on a marketing/branding campaign in the coming months. Discussion about what the district should do to target new students was triggered by a proposal Tuesday night from Assistant Superintendent of Instructional Services Steve Laatsch. Saline has experienced about a four-percent decrease in student enrollment in the past five years, said Superintendent Scot Graden. In 2006, SAS had a fall head count of 5,536 and in the fall of 2011, it had 5,370 students. Laatsch presented a concept for a series of advertisements through Cumulus Radio that would cost Saline a little more than $400 per week for a multi-week campaign. Cumulus Radio has four stations in the Ann Arbor area — 107one, W4 Country 102.9 FM, Sports Talk 1050 WTKA and 1290 AM WLBY — which the company says have a combined base of 270,000 loyal listeners. Laatsch said the marketing set Cumulus proposed would include 21 30-second commercials to be played per day on Cumulus Ann Arbor’s second most-listened-to station, 107one. 107one has approximately 40,000 adult listeners, according to its website. Of the 21 commercials, 10 would be played between 7 p.m. and midnight, while the remaining would be on from 6 a.m. to noon, the proposal said. “(Cumulus) is ready to go with the initial campaign if we decide this is something we want to do now or in a couple of months or down the road,” Laatsch said, adding the concept for the radio advertisements was modeled after the success of the state’s Pure Michigan campaign. He said the recently approved district-wide all-day kindergarten and increased school of choice options make it an optimal time for SAS to attract new students. Trustee Amy Cattell said she would like to see some additional pricing first, prior to discussing the Cumulus proposal further. Her biggest concern was not advertising during the evening rush hour. She also asked what it would cost to advertise on W4 Country, which has 83,000-plus listeners. He said under this type of “multiplier approach,” the businesses would promote Saline Area Schools to attract high quality employees. Holden added this is less exploitative than trying to steal kids from other districts. Trustee David Zimmer suggested reaching out to the city of Saline to see if a joint marketing effort might be of interest to officials. He said it may be a great opportunity to strengthen the relationship between the schools and the city and to dual promote to bring families to Saline. Zimmer added he would like to see administrators do some research on the success of other districts’ marketing campaigns before the board decides whether such branding efforts are worth the expense. Instead of focusing solely on all-day kindergarten and Saline Area Schools being a school of choice, Board President Lisa Slawson proposed emphasizing Saline’s graduate success stories and some of the innovative programs the district offers. “I think the best word of mouth is truly a parent or a teacher or student who is really happy with their experiences,” Slawson said. Graden said previous boards have not been interested in the possibility of marketing or branding for various reasons. He was pleased the current board was interested in contemplating it further, he said. Thu, Jan 12, 2012 : 3:49 a.m.
One of the most important things we can do to keep Saline Schools relevant is not to allow them to slip into mediocrity. The music programs, the advanced placement classes and top-tier faculty are all important pieces. I continue to be impressed by the fact that the administration has not moved into some shiny new office building; they continue to occupy an old school building. Many of the support services run far leaner than their counterparts in other districts, allowing more money to land where the &quot;rubber meets the road&quot;; the classroom. Wed, Jan 11, 2012 : 9:50 p.m.
How did we go from rejecting a huge anonymous donation, because we didn't want to become a school of choice, to needing an advertising/branding budget? Sadly,you have now shown your hand and every parent who doesn't get what they want (cheaper sports fees, pledge of allegiance) will threaten to pull their child from the district coffers. Let's go back to the objective of teaching the children, and use our tax dollars for that purpose, as intended. Wed, Jan 11, 2012 : 3:29 p.m. It's time to take a reality check people. The recent changes to allow more charter schools, continuation of the existing funding model and the regressive aproach to supporting education, created a &quot;free market&quot; approach. Public schools either adapt or go out of business. As to a joint venture with the city? Isn't it basically double taxing the city residents? Wed, Jan 11, 2012 : 2:28 p.m.
Marketing Saline as a area to move to for parents is better than advertising on the local AA radio market. If you did any kind of advertising, it should be to places like Detroit, Lansing, Grand Rapids or other regional areas that Ann Arbor often draws employees from. Wed, Jan 11, 2012 : 1:25 p.m. Please emphasize on the long term, not short term. Improving education and producing successful adults. Use the money to reach out to successful saline graduates to donate and do their part since saline public school has provided them with the highest possible education. I have 3 kids all under 5. I've grown up in the area and had a choice to go to Ypsi, Ann Arbor, Saline, Lincoln, or Plymouth-Canton. We chose Saline. Saline has a great reputation in Washtenaw. It does not need advertising for students to come. Wed, Jan 11, 2012 : 12:42 p.m. I would suggest that the Board consider an in-house speakers bureau of teachers, adminitrators, students, parents, board members and alumni. The radio stations mentioned, as well as other stations (radio and tv) are always looking for human interest stories. What about using Facebook and Linkedin? Civic groups like Rotary and area Chambers of Commerce are always looking for speakers at their various meetings and public events. This would help get the word out about what Saline has to offer. These efforts would cost nothing but the time of the person involved and perhaps limited travel reimbursement. I believe something like this should be tried first before spending any money on radio ads!!! Save this money for direct education services! Wed, Jan 11, 2012 : 12:12 p.m. Does Scott Graden ever speak anymore, or is Steve Laatsch running the show? Maybe Steve has a better radio voice and therefore the proposal. Four hundred dollars a week (or $8400 for the package) could go along way toward Steve's 'instructional services' rather than more talk targeted at people who already live where they do and can afford what are already spending.